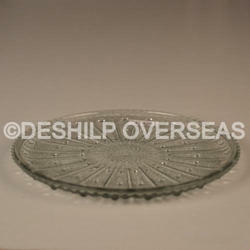 ­Being a leading enterprise of this industry, we are offering a huge range of Rectangular Glass Platter. About Product: Set of 7 Vintage Old Collectible snack plates, pretty fan shape (no cups included in this set - sorry). 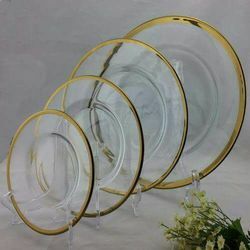 The All seven plates are in very nice condition without damage. Great Set of 7 glass Plates are ready to be part of your collection. Best for your personnel use, home décor or gift anyone.Condition: Photos are part of the description. Please examine photos before purchase. White Saras Art Designer Glass Serving Dish, Size: 4 x 2"
We are offering high quality range of Glass Plate. These are designed and manufacturer as per the client's specific requirement. Crafted using quality raw material and advanced technology, our range is designed by our skilled artisans with their immense creativity. We offer our range at market leading prices. Our trousseau packing is something that worth your investment. Trousseau packing enhances the look of your gift items making it more charming. We offer trousseau packing in different themes and styles that are admired by one and all. Moreover, we provide trousseau packing at the most discounted price in the industry.